An all-hands staff meeting at the beginning of the school year offered a good opportunity for Barbara Streeter, director of Hanna Perkins School, to remind everyone of the care given to the thoughts of preschool and kindergarten students. She asked people to be conscious of magazines that are left in waiting areas throughout the building – removing any that contain scary images or content that isn’t appropriate for young children. “It’s always important, but particularly so in the beginning of the year,” Streeter said. 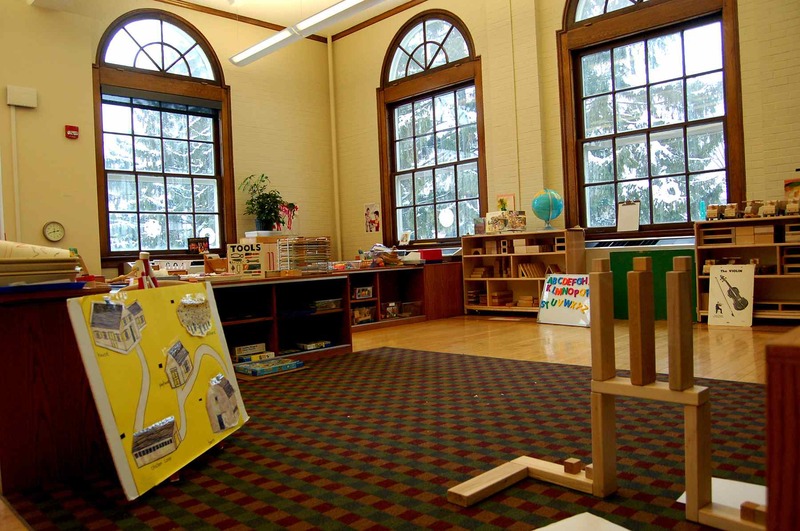 “They are working so hard at being independent human beings without their parents being here; they need a predictable, safe, comfortable and controlled environment. While the same courtesies could apply at any school, Hanna Perkins’ focus on the ability to discuss feelings provides frequent reminders how young children struggle with the unfamiliar and unknown. Their effort to make sense of adult conversations or new sights is confined to their own, limited experience of the world, and it can lead to wildly inaccurate – perhaps troubling – interpretations. This is what development professionals are referring to when they talk about magical thinking in young children. 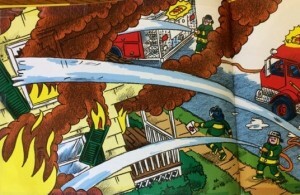 Too close to home: Young children may overlook the fire-fighting action, focusing instead on flames in bedroom windows. Photo of drawing from “My Fire Engine” by Michael Rex. As Exhibit A, Streeter held up a picture book about fire trucks – seemingly appropriate for preschoolers. Who, after all, isn’t fascinated by fire trucks and the heroes who drive them? But it is no longer part of the classroom environment at Hanna Perkins because more than one child has focused on the pictures of flames shooting from windows of a house that – to a 5-year-old – may be a very good rendering of their house. 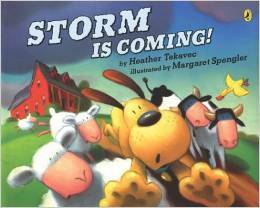 Exhibit B was another book, Storm is Coming, by Heather Tekavec and Margaret Spengler, which Streeter skimmed through at the meeting. It’s about a farmer who observes, out loud, “Storm is coming.” The animals – like young children – misunderstand his meaning. They think Storm is a person – and a scary person at that, based on the concerned tone of the farmer’s voice. As they wait fearfully in their cozy barn for Storm to arrive, the animals welcome the darkening sky, then the rain, wind, thunder and lightning – hopeful that each of these phenomena will scare Storm away. It’s a book that Streeter predicts children will enjoy because they will get the joke early, and they’ll relate to the situation of misunderstanding information that comes to them from the world of adults. A book children will appreciate; it understands their misunderstandings. The school occupies only a portion of Hanna Perkins’ facility, so Streeter also reminded staff members who are not involved in the school’s day-to-day activities that hallways and facilities in that part of the building are off-limits during school hours. In explaining this, she cited the practice of one noted Northeast Ohio pediatrician to put a smock on all babies during well-baby visits. Finally, Streeter reminded the group that the facility doesn’t decorate for, or celebrate, Halloween. Older children have learned to understand the concept of scary fun – though some don’t enjoy it as much as others.